Zara Yong is only 11, but already an active volunteer, having served at an orphanage in Bali and raised funds for survivors of Typhoon Haiyan. This year, the Primary 6 pupil went a step further and had her locks shorn for the annual Hair for Hope event yesterday. By enlisting the help of her parents to share her cause online, she raised over $34,000, making it the first time that a child has been among the top five fund-raisers for the event. More than $19 million has been raised for children with cancer and their families since the annual head shaving event was started in 2003. In the beginning, there were just nine people who volunteered, raising $2,000. Last year, there were 6,190 people who had their heads shorn of hair, with more than $3.3 million raised. The funds go towards the Children's Cancer Foundation's (CCF) services for children with cancer and their families, such as art therapy, academic learning and support services for survivors, caregivers and siblings. Since the start of this year's campaign on May 1, more than 3,000 people have participated. 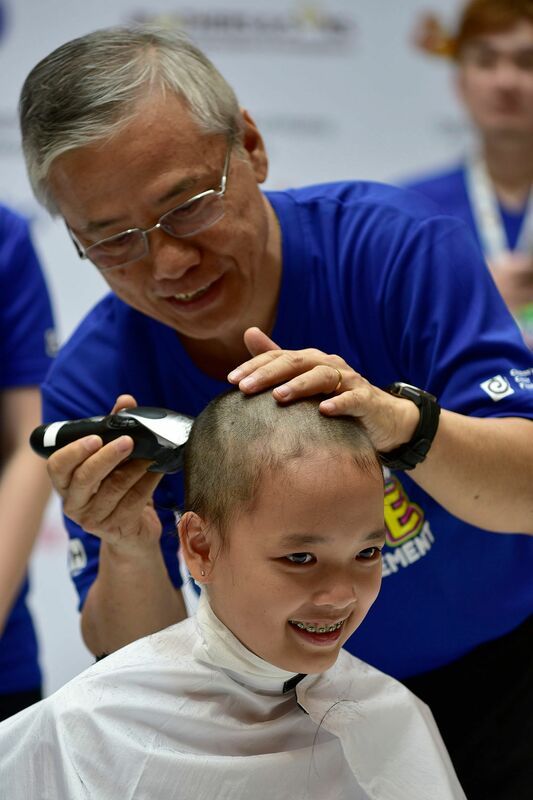 At the main event yesterday at VivoCity, more than 1,500 children and adults braved the razor to show their solidarity for children with cancer, who often lose their hair during treatment. Midway through the exercise, Zara admitted to feeling nervous. "I don't know what I'm going to look like," she said. She said later that a friend who signed up for the event a few years ago inspired her, adding: "I hope I'll be able to do the same for others." Senior Minister of State for Health and the Environment and Water Resources Amy Khor, the guest of honour, thanked all those who volunteered and said that any family with a child who has cancer requires emotional support. "These shaven heads make the point that it is okay to be bald and that the children are not alone in their fight against cancer," she said. Nine-year-old Boon Kye Feng, a CCF beneficiary, has had his head shaved multiple times - after being diagnosed with juvenile myelomonocytic leukaemia in 2012 and suffering a relapse in 2014. But he did so again yesterday for a different cause. "I like to help other children," he said.